Betsey Wittick has a conversation about farming practices with Wilkes students, describing the Makah Ozette potato, one of the varieties which she raises. Betsey Wittick has been a leader in the modern Bainbridge Island Island farm and food community for over two decades. Born and raised in Newark, New Jersey, she has called Bainbridge Island home for 28 years. Betsey has been learning how to grow food to feed people since she was a kid, and how holds rank as one of our region’s master farmers and vintners, operating Laughing Crow Farm and Bainbridge Vineyards. Her history and role in regional farming is one of helping to build the foundation for our local food community, and for future farmers. An educator at heart, Betsey has been teaching about farming to future generations for more than a decade. She runs a farm internship program that attracts young adults from around the U.S. Laughing Crow Farm was EduCulture’s first farmer partner, and hundreds of school children have field classes on her farms each year. Betsey Wittick’s work as as a farmer goes far beyond the dozens of varieties of organic and heirloom vegetables and fruits she raises. Her stewardship of the land and love of animals led to using real draft horsepower to till and fertilize her farmland. Her care and compassion for her fellow farmers has made her a traditional bearer of the sustainable, small scale farming practices that defined our original food community. Her vision for the future of food and farming has led her to be a major investor and mentor in our future farmers and food citizens. It has been an honor to have Betsey as such a generous partner in our Edible Education and Heritage Education programs. In a conversation with EduCulture founder and director Jon Garfunkel, Betsey describes her interest in growing plants, going back to her time as a teenager in New Jersey. She reflects on her current work and her vision of the future of farming, as well as the importance of Edible Education. JG: How long have you been farming and where have you farmed over your career? BW: If you talk about growing plants, I’ve been doing that since I was a kid. Farming – if you want to define that as producing a crop to sell commercially, then it’s been, if you include the winery, about 28 years. JG: And where have you farmed? BW: All of it on Bainbridge. JG: Why did you become a farmer and what keeps you farming? BW: I got involved in farming specifically because of working for Bainbridge Island Vineyards and Winery, helping grow wine grapes and make wine. And while doing that I got involved in farming, farm-based issues – mainly land resources, land preservation – and helping to get folks to understand the value of local farming. At that time there were very few people farming commercially, besides some in the Filipino community, and Akio (Suyematsu), as well as Brian MacWhorter, and the Bentryn’s at the winery. So I got involved in trying to educate people about ways we could save farmland, through transfer of development rights, through trying to get the folks who were growing crops to be more successful at it, and hopefully to encourage new people to get involved in it. 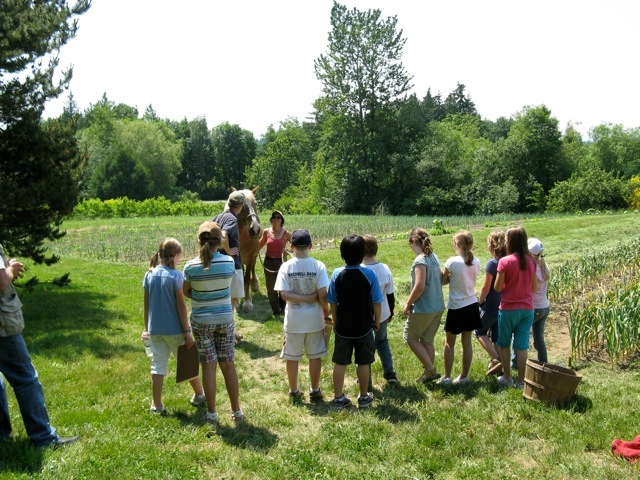 While doing that I also joined groups like Rural Bainbridge Island and Bainbridge Island Grange, and we were hoping to use those forums to educate people and to be a support group for farming. As I did that, I also got involved in Bainbridge Island Farmer’s Market – it was called Winslow Farmer’s Market at the time – and several transplants from California and myself helped to reorganize that into the Bainbridge Island Farmer’s Market. We realized we didn’t have enough vendors to make it a really great farmer’s market, so a few of us pooled our resources together and we had a cooperative booth under the Bainbridge Island Grange, and that was the beginning of Laughing Crow Farm. From there, it grew a little bit more each year. I’m an experimenter by nature, so I was always playing around with “oh, let’s see, I could grow 10 kinds of lettuce, and 7 kinds of carrots, then do a taste test to see which one performed the best and tastes the best,” and from there I kept expanding and trying to find a way to sell it, because I’d have everything coming on at one time. I ended up focusing more on potatoes and garlic, storage crop based stuff, because my schedule at the vineyard took up a lot of time, so I didn’t have time to pick or sell vegetables mid week. I had to really let my vineyard schedule dictate it. Over time, that little cooperative booth became bigger and bigger until eventually I had my own farm stand at the market. JG: And what keeps you farming today? 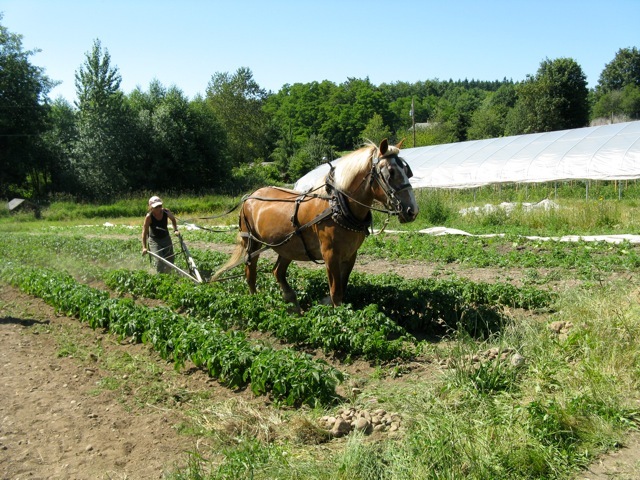 Betsey tilling EduCulture potato rows with her horse Samantha, 2011. BW: Well, I like it. I like being outside. I’m not a desk-based person. There is an amazing opportunity just to connect with the seasons. I love working with farm interns. It’s fun to grow food. It’s challenging from an economic standpoint to survive with it, and I do other things to supplement my income. And that’s why I do it – it’s sort of in your blood. JG: What are some of the things you’ve learned from those who have mentored you as a farmer such as Akio Suyematsu and Joanne and Gerard Bentryn? BW: Well, since I started with Gerard and Joanne, I’ll talk about them – and I certainly learned a lot about growing grapes and making wine and running a business, from everything they had done. I also realized how much work it is now that I’ve taken it on myself, and I appreciate it even more, particularly the paperwork, which is no fun. Gerard was also passionate about local community issues, and I appreciated the fact that he stuck his neck out – very few business people would do that. Whether it was for a political candidate, an environmental issue…he allowed me to take time off from work – and it was salaried, so this was time he was losing – for me to pursue those issues, for the greater good. And I think that’s an important thing to do. I think it’s important to participate in community. From Akio, I think I learned that whole steadfastness – you know, sticking with a job until it’s done – determination to go through all kinds of adversity – certainly with what he experienced in the Internment, although I never really spoke to him directly about a lot of it. Just how to take care of things – he was always working – he’d work until dark, so we felt that’s what you do in farming – you work until the job is done. And of course the most valuable lesson is, “did you grease it?” (laughs) And he’s right, because maintenance is key to survival, in that if you don’t take care of your equipment, you’re certainly not going to be able to afford farming because it will cost you so much in repairs – way more than you can generate in income. JG: Can you briefly describe what kind of food Laughing Crow Farm raises and where your food ends up? BW: As I mentioned before, because I work with the Vineyard, a lot of my crops are somewhat dictated by what works with that kind of a schedule, so things that don’t need refrigeration, that can be harvested ahead of time and held for the time of sales because I don’t always have time right before the market to pick everything. So that’s part of the reason I do potatoes, onions, garlic – the root crops, storage crops. But also cabbage, and peppers – they’re just not as fragile as some other crops. I have no refrigeration, so it allows me to produce and sell those crops with the facility that I have and the time that I have. As far as where I sell them – I bet I sell most of it at the Bainbridge Island Farmer’s Market. I also sell at the farm stand we have here (at Suyematsu), and through Bay Hay and Feed – they have a nice cooperative farm stand, they support a lot of farmers by selling their food – and through some restaurants. BW: Probably the one that’s been most supportive over the years has been Molly Ward Gardens in Poulsbo. He buys hundreds and hundreds and hundreds of pounds from me. Judith Winestock buys a bunch, Hitchcock buys some, Harbor House Pub – those are probably the main ones that I sell to. JG: Why do you grow so many varieties of your dominant plants? BW: I’m not growing the diversity of different vegetables, and one of the ways that I can have diversity from a standpoint of some crops succeed and some fail, is to not put all my eggs in one basket. And I do that through having different varieties, because they all have different traits. I’ve had some years where I’ll have a failure in one particular variety but something else will be good. Also it provides that diversity and I can fill a niche by exploring that one niche and doing a more evolved approach to it, and that’s how I get people to notice me. Because I have all these different kinds of garlic. I have all these different kinds of potatoes, and they’re all geared toward specific uses. I have some that are great for mashing, because they’re light and fluffy, for gnocchi and things like that. Another one would be firmer, like a masher would be Caribe – super light and fluffy, I sell lots of them at Thanksgiving; I have a firm one like Ruby Crescent fingerling, or Charlottes, which are very firm textured, in a situation where you want to it to hold its shaped after you’ve cooked it. Or, the ones that have colored flesh. JG: As the new owner/operator of Bainbridge Vineyards, what kind of wine grapes do you raise and where does your wine end up? BW: We grow grapes that originally were developed or selected in Europe, mostly in Germany and in the northern grape growing regions of France. We are working now with some grapes from Austria and Hungary as well. They are grapes developed for northern areas. They’re mostly white – we do have some reds – but the majority are white wine grapes because as in Europe, that’s what you’ll find, more whites growing in the northern parts of Europe. JG: Can you talk a little about how these are cold climate vs. warm climate and our climate is similar to the climates that these grapes grow in elsewhere. BW: We would be called a cool climate and everybody seems to say they’re a cool climate, but as far as our parallels, in Europe, we would be very similar to the Loire region of France. Also, Alsace between France and Germany, and different regions of Germany and in Switzerland or Northern Italy. So those would be similar parallels as far as temperatures year round, similar rainfall, except that our rainfall falls mostly in the winter, and most of those in Europe have more evenly scattered rain throughout the year. So in some ways it’s easier to grow grapes here, because it’s dryer through the growing season, so we don’t have as many disease problems. This year’s a little bit of any exception, because we’re super dry compared to our normal dry summers. JG: Where does your wine get distributed and where does it end up? BW: Most of it, I’d say we sell at the tasting room right here on the farm. We also sell at a couple of farmer’s markets which is something that I’d like to expand upon if we had the staffing – and some local stores, like Central Market, Town & Country, and Bay Hay are probably our three biggest retailers. We have other retailers too, but those are probably the ones with the greatest number of sales. But by in large I’d say that most of it is at the farm. JG: What went into your decision to structure the winery business as a collaborative partnership? BW: Well, I certainly didn’t want to do it on my own. I prefer to work in groups and a team. I knew just how much work it was from watching Gerard and Joanne over the years and I felt a better situation would be a more cooperative venture, where we all had some additional income besides the winery. The wine business is extremely competitive and I knew we all needed to survive, and by having that be part of our income and not 100% of our income, or folks who had partners with another income, it would help a lot to give us some flexibility and to allow us to get through that early start-up phase. I have also been inspired by the cooperative movement. I think that when people have skin in the game they put more towards something. If their opinions are valued they get to call the shots as well, it’s the good and the bad. A lot of times in business the business owner is working really hard and a lot of times the employees don’t really have a sense of what it takes to run a business. They see money coming in but they don’t see all the expenses. So I think there’s a greater understanding and a stronger business model when people are all involved. They’re valued and they all have an opportunity to offer suggestions. One of the things that really inspired me is the movie “Shift Change”, about the cooperative movement. Mostly it focuses on Mondragon in Spain but it also focuses on cooperatives in the U.S., and it is very inspiring. I would like to see more models like that. We are not a legal cooperative structure but we often use a lot of things borrowed from the cooperative type of business structure. I also formed an LLC so that I could help raise some money and get some local people who were willing to become part of the business by contributing money, and that made a huge difference to us being able to get started, as well as the Bentryns, who helped out quite a bit. BW: Constantly evolving. I feel like every year I learn something. Even though I may have done something 20 years ago, I think that if you pay attention and you’re connected, you’re constantly learning and maybe changing. So I see that we’re maybe doing things differently than when I first started working for the Bentryns. We became certified organic; we were using organic practices for the past 12 years, just because I didn’t like using chemicals out in the field and then ultimately we codified that with our organic certification. My Laughing Crow Farm is not certified organic but I follow all the organic practices in it. I like the sense of connecting that I get. So I would say organic follows those principles, but beyond organic, in living here on the land that I farm and seeing it all the time, it makes me much more sensitive to what’s going on. I’m interested in expanding on that and one of those areas is biodynamic farming, which is more of a homeopathic/holistic approach in many ways, and I’d like to incorporate more of those methods. One of my interests in using draft horses is in being less dependent on fossil fuels, but also it’s a different pacing than using a tractor. It requires a different skill set to connect with an animal to get the job done, versus turning a key on. I think that we’re evolving because I’m constantly looking and saying, “can we do this better? Is there some way that we can be better stewards of the earth?” I do plenty of rototilling with the tractor, but I think it’s really destructive, and I don’t think our soils can maintain that. Our soils are being beaten by things like that. I think there are other ways we could be farming and I’m interested in learning more about them. JG: Can you describe the value of “terroir”, and what you feel is the relationship between place and taste? BW: I think we’re so disconnected food-wise. If you think about the fact that your body is made up of chemicals from a place, that people are made up of the compounds, the foods that turn into their body tissue. Because most people eat from the supermarket and most food is transported from a far distance, they’re really not of the place they live in. They are biologically of someplace else. Now, maybe the water, if they drink water from their tap – but most people are drinking bottled water shipped in from somewhere else! So not even that basic component of life – water – is really from here anymore. So, to me, that whole concept of eating local, terroir, is to become more “of” a place; to experience it through tasting the foods, drinking the wine, having those things be part of your body; ultimately, through eating locally. JG: What is it like for you to be a farmer in 2015 in the United States? BW: It’s interesting, because now it’s becoming trendier, in some ways. I think when I started, it was a pretty novel idea, small scale farming. Most of the farms were big corporate farms, I felt like we were in the beginning of a movement, a food revolution. When I started 28 years ago, getting involved in local food systems – I think at the time, the farmer’s markets were still pretty new, and since then its expanded. When I would say I was farming, people would say, “wow, that’s weird.” But I think what’s happening now, particularly among young people, there are more people farming. I think folks like Brian MacWhorter and I are of that transition generation. Very few of our peers, farm. They all have corporate jobs – they make much more money (laughs). So, we’re sort of the odd group, but I think we were important in helping to connect the new generation, and providing things to help the new generation get started farming. JG: What do you see for the future of farming? What are the challenges, and what are the opportunities? BW: Challenges – let’s start with that. I think the climate change is big. I think we’re seeing examples of that this year. So, being adaptive is going to be super important. We don’t know what to expect yet, so resiliency is going to be key. That also leads me to say that small-scale farming is part of the solution, because it’s much more adaptable than large farming that has really invested a lot in infrastructure, in a style of farming, in equipment that takes 20 years to pay for itself. I think that stuff is not going to do well in the future. So, small-scale farming, new, innovative ideas – maybe including old ideas as part of it; I’m not a proponent of things like GMO. I think there are too many unanswered questions, but I do feel having more of our food produced locally will give us a lot more security and also connect people to the earth, which I think they’re going to need to do to make the changes that are going to be required of our civilization to survive. 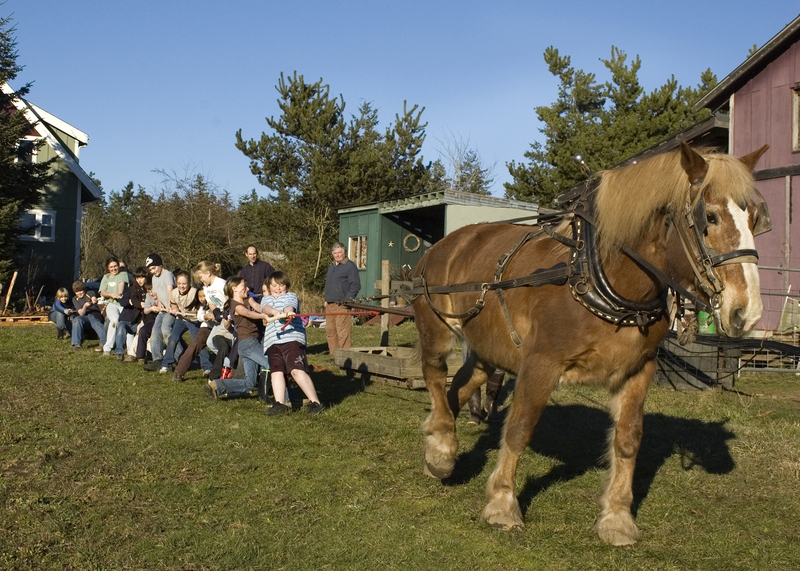 Students visiting Laughing Crow Farm try out a game of tug of war. JG: Where does water play into the future of farming? BW: Certainly, water could become a major limiting factor, and our use of water – particularly if we do get dryer during the growing season – it’s going to be super important to be good stewards of that and use it wisely, so a lot of unknowns. Other challenges have to do with access to land. Where the people, the population is, where potential folks to eat the food are, is getting more and more expensive. I think we need to look at innovative ways to help folks who are entering farming to have access to land. Partnering with people who own the land, community ownership of land, a whole series of things might work to help solve that. These young people haven’t gone off to do the corporate jobs, so they don’t have access to buy it because it’s way too expensive. JG: Why is it important to have locally grown food in our communities, and what kind of local farm and food community do you hope to see for our region? BW: First of all, I think it’s important for food security, even though I don’t often think of that. Having a lot of the problems associated with food – processing of food, contamination of food – is often because there’s not accountability in the food system. So, the more food that’s produced locally, I think it’s safer, healthier for people, and less vulnerable to issues like transportation breakdowns, high transportation costs, etc. Having that here, I’ve never grown up in a time when food was scarce, but people who grew up during major wars – like in Europe, really honor the fact that they have local food there, because you couldn’t get it, because we didn’t have a way of moving food in. I think we’re living in a very complacent society, where we have access to everything all the time, and I don’t necessarily think that’s going to last forever. So, having food, the ability to grow food, knowledge around growing food, and land to grow food, and people who can do it, I think is super important to the future. Also – it’s nice to have it, from a visual standpoint. There’s a connection that happens, there’s a spirituality that happens when you see that whole continuum, of here it is, and then you transform it, you know that person who made it. Food is pretty anonymous – it comes in packaged containers. Marketing people have known that people crave that connection, so if you look at packaging of processed foods, it has all kinds of stories on there, even though maybe it’s a corporation that owns it, they spin it, so it seems like – ‘oh, it’s a little farmer growing it’ – because people read those things. And they want it, even if they’re not aware they want that connection, they still look for it. So, let’s have real connections, versus artificially marketing created stories. JG: Through your internship program, what are you learning about young farmers who come work for you? BW: Learning about young people, in general – not all of them are destined to be farmers, but they think it is important enough to spend a season learning about farming, and I really admire that. I think it’s partly because the educational system has brought up issues about what’s going to happen, that they feel it’s important to learn something about food. As one said to me, “the most radical act you could do is grow your own food.” And I kind of believe that. What’s so cool about these young people is that they are willing to step into that. It’s a very risky business, it’s a lot of hard work, it doesn’t have the kinds of financial rewards of some other kinds of professions they might choose, but they still do it anyway. And it’s encouraging to see how many who have been through intern programs like the one I help to run, as well as other farms, how successful they are in starting to run their own farm. I hope that they can continue to be successful in the future, particularly if they choose to raise a family, which is super expensive and much more challenging to be able to come up with the financial resources to give them all the things that the kids want, all the things that their friends have, with a farming income. But that doesn’t mean that there won’t be a solution to that. 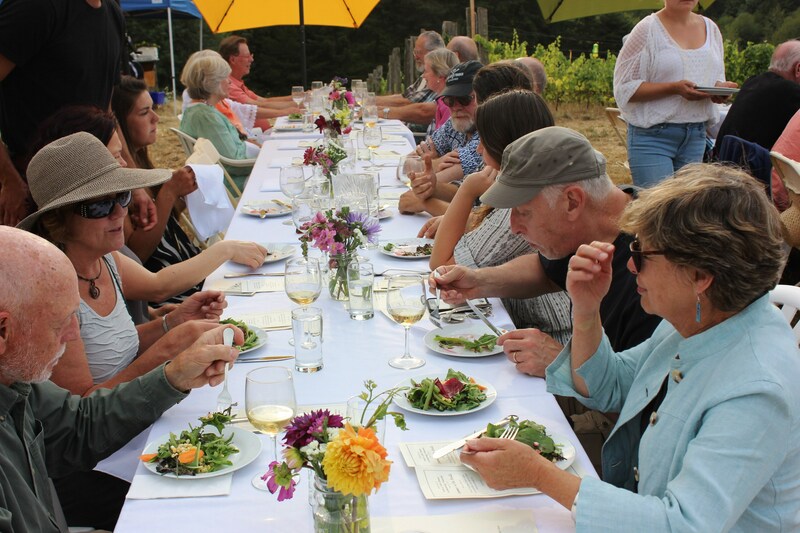 Betsey (left, in hat) at the EduCulture Summer 2015 Farm to Table Dinner at Suyematsu Farm and Bainbridge Vineyards. JG: How many young people have come to work with you over the years? BW: It has to be at least 8-10 years now, and there have been over 30 individuals. Not everybody’s farming, but a good percentage, almost 50% – are doing some kind of farming on their own. It changes them. I use the time besides talking about farming skills to talk about other kinds of values – environmental values – teaching them more than just vegetables. We also look at trees, we learn about birds, other things, that when you’re out on a farm, make it more interesting. You can tell a lot about what’s going on, by things like what birds are coming through, what the season is like. And hopefully inspire them to get more connected, no matter what they do. If they choose to farm, they certainly will have a different appreciation for food. They always tell me, we’re food snobs now – not, “oh we had potatoes for dinner,” but “what kind of potato?” and “what kind of tomato?” They get to taste real food and it changes them forever. JG: You were our first farm partner when we started out many years ago, so where does your interest in serving K-12 education and working with young people come from? BW: It came from my teacher friend Tamara Stone. She would always try to do innovative field trips for the kids, and part of her school program in North Kitsap, which she was always doing on a shoestring budget – was to take them to a pioneer village – and she would say, “why are we spending all this money to go down there, and this long trip, when we could be doing something here?” So she asked me if she could bring her students over here for a day on the farm and we came up with activities for them to do and I later had another teacher come by, and ask if they could do that too. Pretty soon we’re doing all these educational based programs and as much as I liked it and having the kids around, I just didn’t have the time with my farming schedule to do that. So luckily that’s when you came along with EduCulture, and were willing to take that on. I thought it was an important thing to offer, I just didn’t have the resources to do it. Betsey discusses farming techniques with Bill Covert’s 4th graders from Wilkes Elementary School. 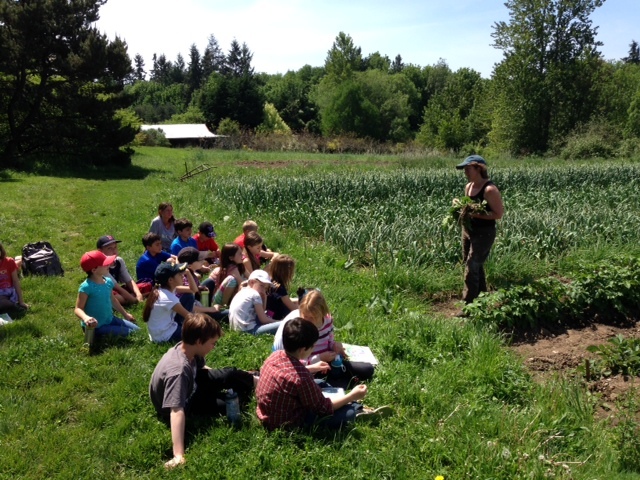 JG: What does edible education mean to you as a farmer? 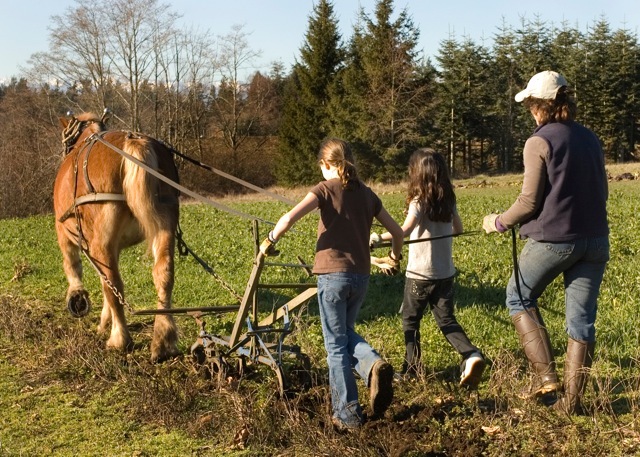 What is important for young people to be learning about farming and food? Why is it important for them to have that as part of their school experience? BW: Some kids are getting it at home, because it’s an important enough issue in places like Bainbridge, where people do have a garden. A lot of folks are fairly well educated about environmental issues and I think they do understand it. But there are a lot of kids who don’t, and I think schools are a great way to provide an opportunity about what’s possible, and getting kids who may never have seen what it’s like to harvest a potato, where they come from; or taste a garlic scape, or pick cherry tomatoes…how much fun it is, and how tasty it is. Also, to learn how to cook food. We eat so much processed food, we eat out, we eat packaged foods, we don’t spend the time cooking and sharing meals anymore, because everyone’s in such a rat race. JG: So from your perspective as a farmer, what do you see as the most essential basic skills and knowledge that all children should have about farming and food? BW: People should have an experience of actually growing it, only because if there came a time when they had to, they could know it’s possible. Rather than, “where do I start?” it’s “well, I did it before, so I can do it again.” Just having some kind of horticultural experience, to know its possible. And with that knowledge, comes the question, if I didn’t have food, how could I access food? I can just grow it – it’s that simple. I don’t have to go to the grocery store. But we’re hooked on that – we’ve forgotten a lot of skills that everyone used to take for granted. JG: Why is it important for you to have edible education programs and farm-school partnerships on Laughing Crow Farm and Bainbridge Vineyards? BW: It’s fun to see the kids – it adds another dimension. It exposes them to other things that are happening on the island. A lot of kids don’t see it, that there is actually farming here. A lot of our food is still imported, as they say, but it exists here. I know kids who grew up on Bainbridge who never knew this place existed. So that’s one thing. Just to say, there is something here in the community that’s pretty unique and special. And people find out about it. Whether their parents find out about it, and then maybe their parents help support the local farms, they heard about it from their kids. And maybe the kids get inspired to grow something; it’s another option for them. Everything doesn’t have to be sitting in the corporate boardroom, being bored, they can be out on the farm, learning how to grow stuff and observing nature. I think it’s a good win-win. JG: Given all of your life experiences, did you have any idea that this is where you would be in your life in 2015, farming on Bainbridge Island, being a master farmer, leading a food community? BW: I never knew of Bainbridge Island when I grew up, I thought I’d be on the East Coast somewhere. As a young kid, I always loved science, so I figured I’d be in some aspect of science. I was very interested in marine biology, always grew plants. I grew vegetables before I even knew how to eat them. Because when I grew up, vegetables came in Bird’s Eye frozen packages; you threw it in boiling water, and that’s how you ate that. We ate broccoli, peas; green beans were in a can; corn came on the cob once in a while, we could get that certain times of the year. Garlic was either garlic salt or garlic powder, and bulbs of garlic came in little cardboard packages with a little cellophane wrapper and two little heads of garlic. So that was food. I started growing stuff but I didn’t know how to cook it, so I gave it away. We had horticultural encyclopedias, so I’d take them out and start reading them, and just start digging in the lawn. Every year I’d take another foot out of the lawn, because it was fun to grow stuff – I was in high school, or younger. I just liked growing plants. I liked trees – I would look at tree branches, pick up sticks. I’d sign up for Jackson & Perkins roses – you could do a test thing – so I’d do a report on roses. In Newark, where I grew up, some older people had vegetable gardens, or grapes they made wine out of, or a fig tree, maybe tomatoes. The milkman would deliver eggs and other things in season but I wasn’t near the farming part of New Jersey, where there was still a lot of farming happening, the truck farms, historically. That’s why it’s called The Garden State. 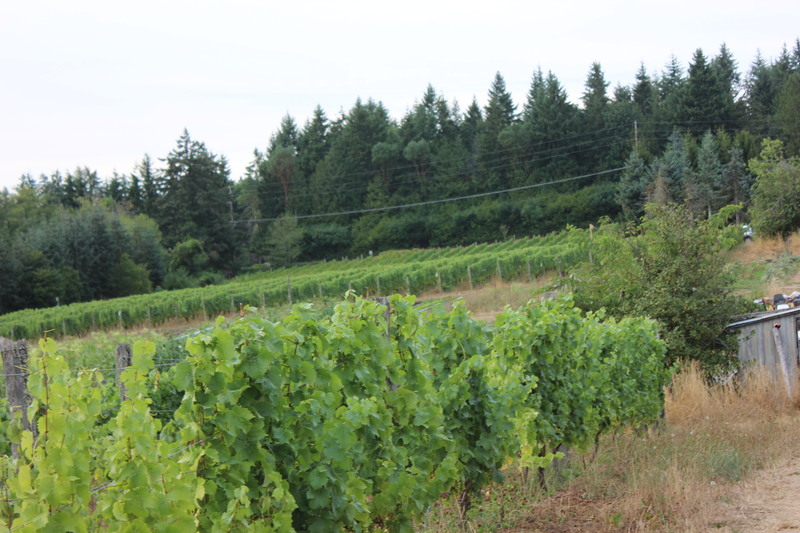 Click here to visit the Bainbridge Vineyards website.